Company line: Wipeout caused jaws to drop the world over and became an instant classic. Now WipeOut XL is poised to take anti-gravity racing completely over the edge. Lightning-fast reflexes rule in this race 'n' chase thriller where your goal is to stay in the lead and defend your craft against other pilots. Negotiate hairpin turns, make gut-wrenching drops and initiate jumps all while blasting your opponents with intimidating weaponry. With faster, smoother graphics, more tracks, more vehicles, and more weapons, WipeOut XL sets a new standard in 32-bit gaming! History: In early 1996, a very slick futuristic racing game appeared that needed some really powerful hardware to run. The game sequel has been anticipated and is now close to release with the sequel in the rest of the world called WipeOut 2097 and in the US and Canada WipeOut XL. Why is it that we cannot have the same name in the whole wide world you ask. Well it is because many companies cannot exist without a lot of petty bickering over names. So if you are confused think of the company executives that are embroiled in these name battles. Reminds me of the name battles we had as kids. Smile. Game play: There are four major challenges in the game which will involve the player racing multiple tracks. The challenges start out easy and get increasingly harder. The player will be rewarded with new game features on completion of a challenge and will be able to save their progress either on a Memory Card or by using the password system. Features include arcade style racing with checkpoints, shield damage meters and pit lanes. You can now eliminate enemy competitors from the track - but beware you can also be eliminated. Psygnosis invested a lot of time improving the general feel of the game play. Features such as more accurate and forgiving collisions, exciting new weapons and more enemies to race against result in a far more polished and pure gaming experience. Enhanced data storage methods mean that loading times between menu and game have been greatly reduced. Modes: There are four racing modes including two multi-player discussed below, including Arcade, Time Trial, Two player Head to Head and Two player Arcade. Arcade (main mode). Racing against eleven other competitors. Finishing in position 1st, 2nd or 3rd will award the player with Gold, Silver and Bronze medals respectively. Time Trial is a race against the clock. No enemy racers or weapon grids. Player receives one turbo per lap. For the two player versions see multi-player below. Two new racing classes (racing speeds) making a total of four. A slower racing class caters for beginners, while an ultra quick racing class will satisfy die hard Wipeout fans. The Time Trial option has a ghost racer which represents your best race. It means the player continuously knows whether they are on target for a record race or not and is a vast improvement over the original game where you only knew how successful you were when you crossed the line. Racing teams and classes: All teams have individual craft designs. The teams are: AG Systems from Japan, Auricom Research from the USA, Qirex from Russia and FEISAR from the European Consortium. There is also rumor of a newcomer team to the F5000 league. There are four racing classes (racing speeds). Vector is the easiest and aimed at the first time Wipeout player. Venom is faster for the slightly more experienced player. Rapier is very fast and is aimed at the expert player. Weapons and Powerups: A host of new weapons and powerups with some great real time special effects. There is a new, intelligent weapon activating system which distributes weapons and powerups based on the player's race position. There is a range of new weapons and powerups in Wipeout XL as well as the favorites from Wipeout, including missiles, rockets, electrobolt, thunder bomb, quake, plasma bold, mines, turbo, auto-pilot, emergency E pack, and shield. The missile is fired from the front of the craft, and has heat seeking capability. There are three rockets fired together from the front of the craft. The intense electro-static energy of the Electrobolt weapon causes the target craft to shake whilst slowly draining it's shield energy. The thunder bomb flash causes a major energy drain on all visible crafts. The Quake releases a flaming earthquake down the track damaging crafts by knocking them in the air. The Plasma Bolt requires a 2 second charge-up time before a super powerful plasma blast is fired down the track. This weapon is not heat seeking, but a successful hit will cause major shield energy damage. The Mines releases a batch of five mines from the back end of the craft which hover for a few seconds and then explode. The Turbo boosts speed very quickly for a few seconds. Good for overtaking. The Autopilot automatically steers the craft along the track for about 5 seconds. All you have to worry about is the accelerator button! The Emergency E-Pak replenishes shield energy. The Shield protects against enemy weapon attacks and collision damage for about 5 seconds. Cannot activate another weapon whilst the shield is activated. Tracks (called Circuits in Europe): There are eight completely new circuits (two of them are hidden in the game). Locations are set across the world. The new circuits feature impressive animated scenery and some even have weather. The difficulty is keyed into the track, not into a user adjustable matrix of skill attenuators, which is the prefered method. Two tracks are easy (novice), two intermediate, and two hard. Artificial intelligence: Improved artificial intelligence on enemy crafts. We have given each enemy craft on the grid (and there are 12 now) a series of variables for racing ability and weapons ability. This means that we have been able to carefully tune the level of challenge for both beginners and experts. Having an increased amount of craft on the track means that the player never feels that they are racing alone. Interface: A new menu system makes getting where you want in the program easier. Views: Internal and external view feature allows both first person and third person perspective. Graphics: The approximately 400,000 polygons per track with multiple resolutions means that the game will look better than the first one. Designers Republic have designed new logos for teams, racing classes and weapons. There are enhanced lighting effects. Animation: The animation is 50% faster in expert mode. There are 150 thousand textured, shaded polygons per sec. This means that the game runs in 25 FPS for PAL and 30 FPS for NTSC, and the fps depends upon the power of the PC when playing the PC game, but 30 fps should be easy for a fast Pentium. The animation has been optimized for 3D accelerators. Music score: The sounds and music were selected to complete the player's immersion in the game. From the Dolby Surround sound effects to the soundtrack featuring Chemical Brothers, Future Sound of London, Fluke, The Prodigy, Photek, Cold Storage and more - we have spared no effort to bring home the blazing futuristic thrills you've come to expect. The wave tracks are 33 to 35 seconds long. All the music tracks from Cold Storage were written and produced in-house by Tim Wright. The Cold Storage techno sound track drives right through the game. One of the best soundrtracks available. Sound effects: Audio cues to the action in the game run throughout, giving you directional information and allowing you to keep your eyes on the fast paced action. Multi-player: There are two multi-player modes: two player head to head and two player arcade. 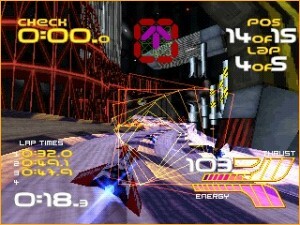 Two player Head to Head is a frenzied one on one race with no computer controlled racers. Two player Arcade is the same as Head to Head but with all the computer controlled crafts racing as well. Two Player serial link supported. Glen Broderick, Computer Player, volume 3, number 6, January, 1997, pg. 38.